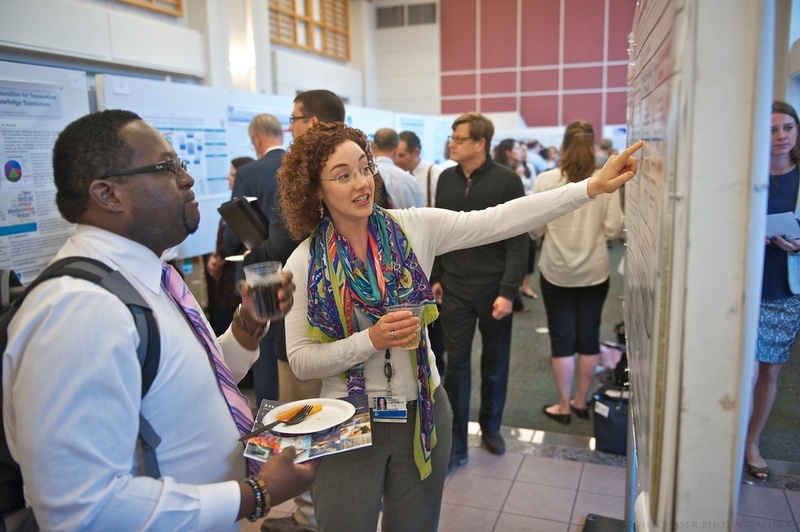 The BluePrint event celebrated innovations in process improvement, care redesign, health information technology and more, with panel sessions, workshops, a keynote address and a poster session throughout the afternoon. Read on for a few of the event highlights. Wristwatches that record vital signs every second. Devices that constantly monitor fluid levels in congestive heart failure patients. Novel inventions like these are the next frontier of health information technology, with the capacity to churn out truly huge amounts of data. But how can we use these numbers in a meaningful way? BWH’s Adam Landman, MD; Paul Ridker, MD, MPH; Ramin Khorasani, MD, MPH; and Dennis Orgill, MD, PhD, share their journeys as innovators during one panel. This was the main topic explored during the Innovations in Health Information Technology panel. Panelists discussed the prospect of data being automatically sent to a patient’s physician for review, and using data to engage patients in their own care, showing them how daily choices like going for a walk can affect their health. Regardless of how data is used, an ongoing challenge will be ensuring patients are comfortable storing and transferring their information, panelists said. “We need to create strong, safe electronic systems that people feel confident using and that aren’t at risk of being breached,” said moderator Jim Noga, chief information officer for Partners HealthCare. Innovative projects and ways of thinking infuse energy across BWH. Panelists shared some of their exciting work, including the use of Webcam technology to enhance care and collaboration with community hospitals; the streamlined redesign of Emergency Medicine at BWH; and the embedding of Mental Health services and the Centering Pregnancy group health model into BWH’s care of high-risk pregnant women. Denise Lautenbach, a project manager in the Department of Medicine, discusses her research with a fellow BWHer. “The themes represented by these projects include the critical importance of data, as well as collaboration as keys to success,” said panel moderator Jessica Dudley, MD, chief medical officer of the Brigham and Women’s Physicians Organization. First-person accounts of innovation resonated with those who attended the Innovator’s Journey session, which featured the success stories of four physician innovators. The diverse stories provided key insights into the process of translating an idea into the clinical space-from smart phone photo apps for the electronic health record to creating skin substitutes. Rodrigo Martinez, of IDEO, presents an engaging keynote address at BWH’s inaugural Clinical Innovation Day. “If there is one 30-minute space to think wild and crazy, this should be it,” said Rodrigo Martinez during his keynote address in Bornstein Amphitheater. Martinez is the life sciences chief strategist at IDEO, a global design firm that takes a human-centered, design-based approach to helping organizations innovate and grow. He engaged the audience by sharing his insight and personal experiences in designing health care products and processes that use simplicity and creativity and keep the human experience in mind. He shared some of his projects, including the design of an operating room based on NASCAR’s pit crew workflow and an insulin kit inspired by everything from personal electronics packaging to pizza boxes. “Serious play anchors the innovation process,” said Martinez.